The Glarus railway station has direct views of the surrounding mountains. As a group of teenage girls eat lunch outside on a cloudless, warm afternoon, they discuss their plans for the upcoming Sunday. 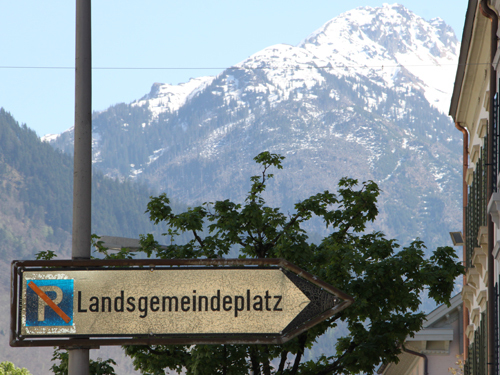 To the uninitiated, it sounds like they're planning for a city-wide party, called "The Landsgemeinde," to be held in this small Swiss town of Glarus. Rachel, a 21-year-old native, said she was looking forward to "a big party -- a city party," and many street foods, particularly the Kebaps made in a stand where she is an employee. "Seeing all the people you know," also ranked high on her list. Her friend Alexandra, 18, also from this town nestled in a valley of the Alps, was in full agreement. "All the people know each other," she said. "Every year, it's the same, all the same people, and the same foods." Sina Stadler, 23, felt similarly. Stadler, who works for the tourism board and a local restaurant, said she was looking forward to seeing all of the people that no longer live in Glarus, but would be coming back. Rachel, Alex, and two of their friends eat lunch in front of Glarus? ?central church. However, the citizens of the Canton of Glarus -- one of Switzerland's smallest with an adult population of about 35,000, according to Canton officials -- are not partying. Per se. Instead, they are participating in one of the biggest shows of direct democracy in Switzerland. Since about 1387, Glarus' citizens have gathered for landsgemeinden (outdoor, town-hall style meetings) where they debate and vote on all of the canton's public business. Of Switzerland's 26 cantons, only two retain the landsgemeinde system, Glarus and Appenzell Inner Rhodes. 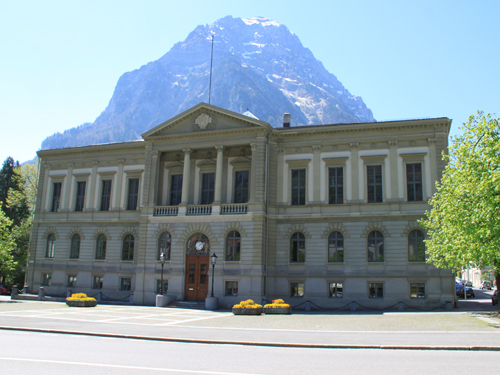 In Glarus, unlike representative democracies, no legislative decision can become law without the direct approval of the citizens; the Landsgemeinde is the highest executive in the canton. Glarus' Staatskanzlei (Secretary General) Hansjorg Durst said this system gives everyone the chance to participate in crucial decisions. "Our parliament and the government will send a motion to the landsgemeinde, and a citizen can climb the stage and say, 'Oh no, I'm not agreeing with this point of the motion, I would like to change it,'" Durst said. "Then the landsgemeinde has to discuss it, and will decide immediately if the entire group wishes to make the change." 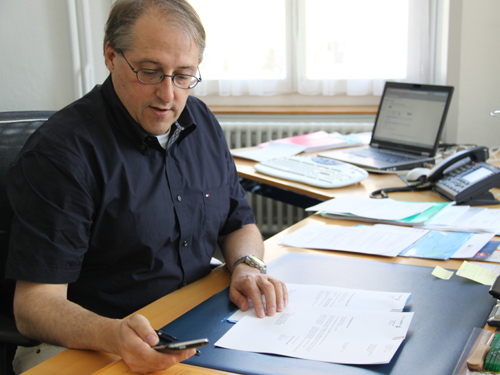 Hansjorg Durst works at his desk in the canton office building, the Rathaus. This discussion, and the meeting as a whole, operates by a series of rules. The landsgemeinde begins with a procession of citizens and the Glarus Band from the canton offices to a "ring" wooden of bleachers constructed in a plaza a few blocks away where some 6,000 to 9,000 voters gather. It is organized by a thick book called the Memorial. The Memorial, Durst, 52, explained, is prepared each year and acts as the meeting's agenda. It contains all of the items to be voted on that day, along with the parliament's voting recommendation for each motion. Citizens, too, may submit items for inclusion in the Memorial, which is distributed to every eligible voter by mail one month before the meeting. This year there are 22 items in the Memorial, seven or eight more than an "average" year, according to Durst. Some of the biggest issues to be debated are the 2010 cantonal tax rates, whether all public transit should be free, the size of restaurants that will be subject to smoking bans, handicapped accessibility, and if voting rights should be extended to immigrants. 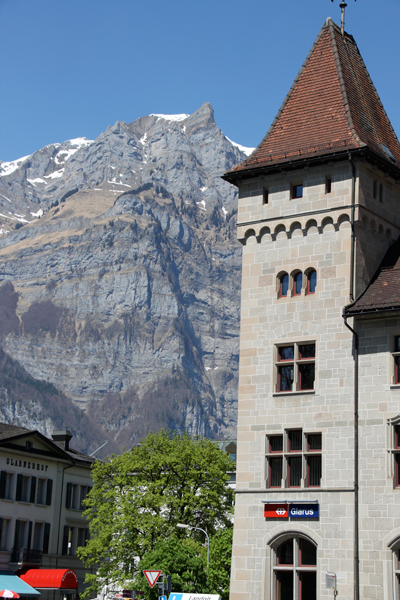 The Glarus Rathaus, like the canton itself, sits in a valley with mountains surrounding it. A 360 degree panorama made from inside the "ring" while under construction on Friday. The chair of the meeting is called the Landamman. He proceeds through the Memorial, bringing each item up for discussion; if there are no alternative motions, items are passed without a vote. However, if any citizen would like to make a change to the government's proposal, they may suggest it and have their idea debated by the entire landsgemeinde. Before amendments to the proposals are voted on, the Landamman checks them for constitutionality and practicality. Citizens vote by raising hands (they could be asked to stand to make counting easier in close votes) and the Landamman estimates which group has the majority. This, Durst said, is an extremely fast way to count votes. Once made, the Landamman's estimates are final. Despite a search for an electronic alternative that might be as fast and more accurate, there are no pending plans to change the counting system. With the larger-than-normal Memorial this year, Canton officials expect the landsgemeinde to run from 9:30 a.m. to about 2:30 p.m. without any break. 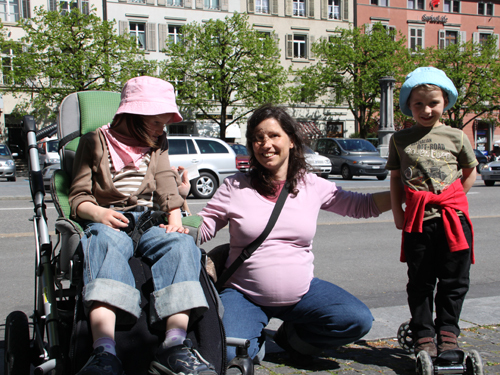 Simone Weber walks with her two children in front of the Rathaus. Clearly, people do more than voting alone. While the primary mission of the landsgemeinde is to make political decisions, as the teens suggested, socializing is also deeply important to most attendees. For those less politically engaged -- which accounts for most of the Canton, as voter turnout at landsgemeinden hovers between 20 and 30 percent -- it is a way to see people from the community. Simone Weber, a life-long resident of Glarus, said she would be at the landsgemeinde, but that she has little taste for politics. Instead, the mother of two said she would go to "meet friends and see people I haven't seen in a long time." Johanna Fishli, who works in the Canton library, said she goes to see friends and for the distinctive food. The 48-year-old said restaurants and street vendors prepare a special meal of kalberwurst (a white sausage), mashed potatoes, and prunes. Stadler, the tourism office employee, also works in a restaurant that specializes in the landsgemeinde meal. "But I don't like it, myself," Stadler said. "I eat sweets!" Her favorite is Magenbrot, a cinnamon and chocolate cake. 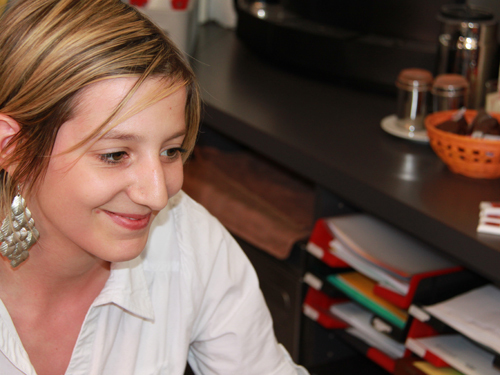 At one of Sina Stadler jobs, she welcomes visitors at the Glarus tourism office. Even for those embedded in the canton's politics, like Durst, there is still a clear desire to socialize. "We have a lot of guests at the landesgeminde," he said. "We are proud of this event, and we are proud to show other people the purpose of this event." Whether people come for politics, friends, or otherwise, the people who come to the landsgemeinde still need to eat and sleep. While neither the canton nor the tourism organization track overall expenditures over the course of the day, local service businesses call it one of their biggest for the year. Michaela Eberhard, who runs the Hotel Stadthof Glarus, said about 75 percent of her rooms are booked a year in advance by families that come every year. TO handle the increased demand for food, she opens a second floor of her hotel's restaurant for post-landsgemeinde meals. "Three hundred people ate here last year," after the voting ended, she said. "On a normal Sunday, we see 30 people. A great one would be 50 people." About 220 of the 300 diners ate kalberwurst in 2009. Pride in the canton's heritage of direct democracy seems to overflow. Asking a citizen about the landsgemeinde was an immediate opportunity for them to gush about "pride" in what makes their canton "special." The 18-year-old Alex best summarized the views of her "dear fellow countrymen," -- the term speakers use to address the crowd gathered at landsgemeinden. "It is special, this thing," she said. "It is from Glarus, our canton. It is our tradition, and I wouldn't change a thing." Permanent street signs point to the plaza where the wooden "ring" of bleachers are constructed each year. However, the desire to keep the landsgemeinde has not stopped residents from updating the meeting to fit the political needs of the day. From 1623 to 1837 there were three landsgemeinden in Glarus: one for catholics, another for protestants, and a third combined meeting. Legislative and executive powers were first separated comparatively late, in 1887. The most recent fundamental change was in 1972, when women were first allowed to participate. The "ring" of bleachers was restructured into an oval to accommodate double the participants. When asked if the canton might ever make changes to the landsgemeinde that eventually phased it out, Durst scoffed. He could think of only one reason that might force a change on the Canton of Glarus. "I think we would get some problems if our canton was double the size," he said. "That's the limit."